What better way is there to fulfill a childhood guilty pleasure than making s’mores? Crunchy graham crackers, gooey marshmallows, and rich chocolate… there are very few better combinations. Unfortunately, it isn’t so easy to whip out the campfire any old night. Especially in bad weather. This recipe is quick, easy, and all of the fun of traditional s’mores without the mess. I’ve also lightened up the calories in the crust… guilt free if you ask the chef! 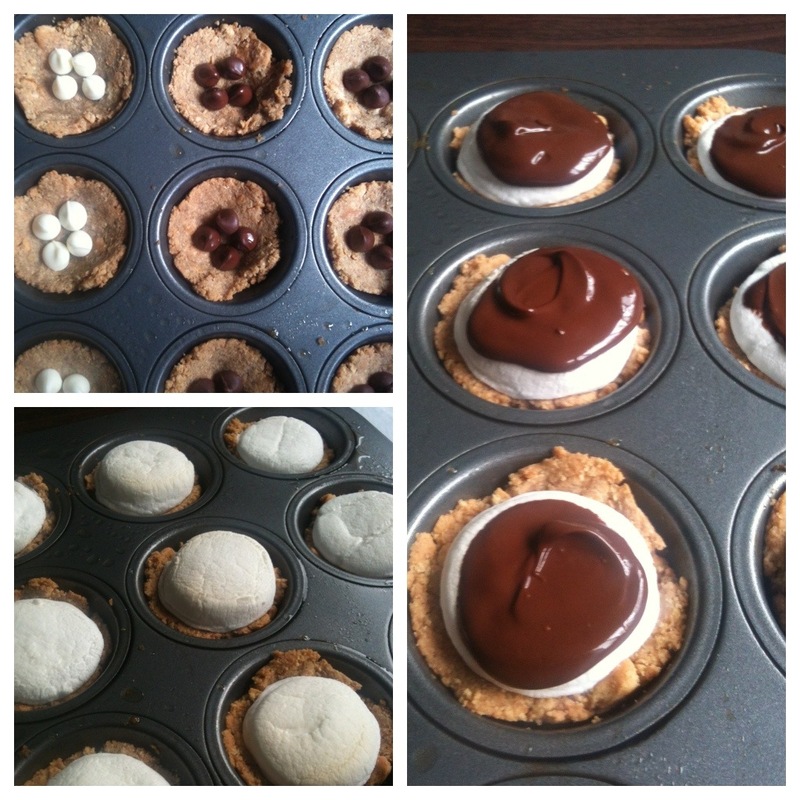 The recipe makes 24 mini s’mores, but I wouldn’t hold back from doubling it. These little hand-held morels go fast in a crowd. Heck, they went fast in our crowd of two. Put the graham crackers in a food processor and blend until they are in fine crumbs. In a medium microwave safe bowl, melt the butter and applesauce. Remove and add the cracker crumbs. Mix together with your hands to form the crust. It should have the consistency of wet sand. Spray the mini appetizer pan with cooking spray. Divide the crust among the 24 cups; press the filling into each cup so that it is in a firm layer on the bottom and begins to naturally form a small bowl around the edges. You don’t need too much filling per cup, a scant tbs is plenty. Bake in the oven for 5 minutes, remove and cool slightly. Place 4 chocolate chips in the center of each crust. I chose to use white chocolate and semisweet chocolate for variation, but either choice is a good one. Cover the chocolate chips with a half of a marshmallow and bake again in the oven for 5 minutes. The marshmallows should be slightly golden brown. Set aside to cool. Put the remaining chocolate chips into your original crust bowl. Microwave until the chocolate is completely melted, about 1 minute and 30 seconds, stirring each 30 seconds. Add the vanilla extract. Use a small spoon to drizzle the chocolate over each marshmallow. Leave enough showing so that you know the marshmallow is inside. Let cool completely, at least 20 minutes before serving. Can be stored at room temperature in an air-tight container for 2 days.